The New Zealand Constitution Party was launched yesterday by Roma Warren (‘Maori of Tainui descent’) and Stephanie Pont (‘European descent’). can democracy truly work and human dignity be seen. Any new party has an uphill battle to get traction with the media and with the public. This, largely a single issue party (although they have a range of general principles) that is promoting a constitution will find it hard to to find a formula for popular appeal. First they will need to sign up 500 members so they can stand as a party under MMP. They will need to to convinced media they can be a serious contender. And they will need to get 5% of the vote to succeed in an election. And getting into Parliament may be the easy part. Getting enough MPs and parties to agree to attempt to write a constitution would be a challenge, and getting agreement on a constitution would be harder. But good on them for trying – this may at least advance debate on a constitution. But any serious attempt at getting a well intentioned party up and running should be given serious consideration. An initial challenge is likely to be to deal with the attempts at discrediting and the spoiling tactics common from activists trying to protect the status quo dominance of National and Labour. Former Prime Minister and constitutional law expert Sir Geoffrey Palmer co-authored two books on constitutional reform in New Zealand. He said New Zealanders are largely unaware of how government works due, in part, to the fact that a constitution can’t be found in any one place. It’s scattered through acts of Parliament, legal documents, decisions of the courts and other legal conventions. He points to the UK – one of the few countries without a constitution – as an example. “The British have had spectacular difficulty with theirs in recent times,” Palmer said. But a new party would have difficulty gaining traction in the 2020 general election, he said. But we are heading to the 2020 in an unprecedented situation under MMP – small parties have dropped out of Parliament or are battling to beat the 5% threshold (Greens and NZ First). There is the potential for voter resistance to moving towards a two party parliament, so there could be an opportunity for new parties to fill the void left by fading small parties. The terminology seems to come from US , where the federal government has its constitution, the states have their own constitution, and a lot of cities have their municipal charter. I agree, except for the ‘high-class’, which flatters it too much. What a load of confused waffly codswollop. If that is what they envision a constitution to be they have a very long way to go. Agree,it’s waffle, rather incoherent and the reference to democratic socialism dreadfully reminiscent of totalitarian regimes.It a political doctrine such as democratic socialism is prescribed then it is not in my view a constitution, but a political gimmick. And no ‘law students’ doing a project for Summer School and extra credit , which this waffle has the hint of. Under this heading were some very defining powers. Powers that would neuter any government. Powers no New Zealand government would stand for. I knew things could only get worse from here on. And things did. When are people going to get – if you enshrine individuals rights- everything else falls into place. Strange launch of a New Party. 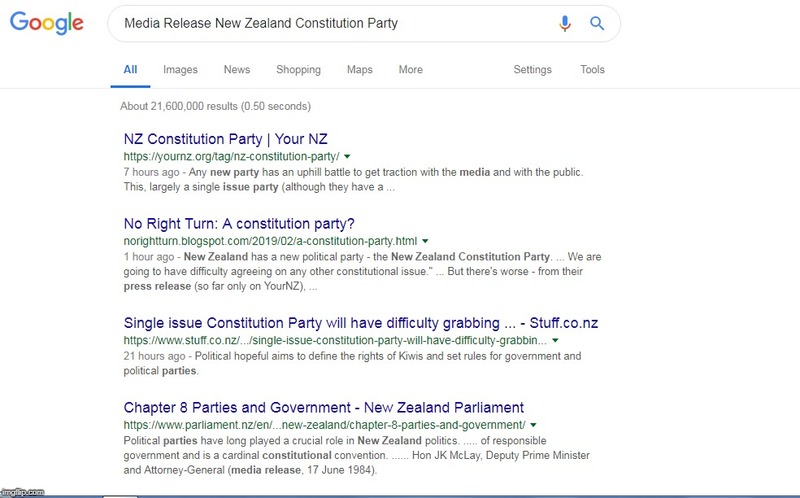 I’ve been googling New Zealand Constitution Party to see what the background of the two people mentioned is and all that’s coming up is the stuff article and PG’s post. I tried Facebook with no luck. Dunno where PG got that stuff for his post from. Maybe I should have been checking Twitter or Instagram or whatever. Unless Google has been heavied by some sinister dark & powerful cabal who thinks they’re a clear and present danger, they haven’t exactly conquered the internet or the airwaves. If they have no PR then they must be suss. I think you might be getting carried away a bit there. Maybe too much interaction with Mother. And I thought you weren’t religious? I was addressing the Left in case there were any stragglers. I’m never in the Left’s queue, PZ. Where’s ‘free market’ capitalism if contracts aren’t ‘sacred’? All abase before the profane dollar! A Government cannot bind its successors. Of course it can … What a stupid thing to say! What about Alliances … like we have with Five Eyes? No it can’t. Don’t you know any constitutional law. Parliament can do whatever it chooses and deal with the consequences. Courts have always confirmed that. Yes … but, like good Righties, we could always talk about what REALLY HAPPENS in the Rightie REAL WORLD too! I am launching my own party before the next election. In fact I believe it is the duty of every Kiwi to stand at the next election. If you’ll stand for Parliament you’ll probably stand for anything. Just tell your target audience what they want to hear is the key. Never challenge your prospective voters. Just confirm prejudice and ignorance. Always works. Just to show that any one can be a politician. It’s not rocket Science. It’s really all bluff.